"Good economics makes for good politics. We are today at the cusp of a development explosion." 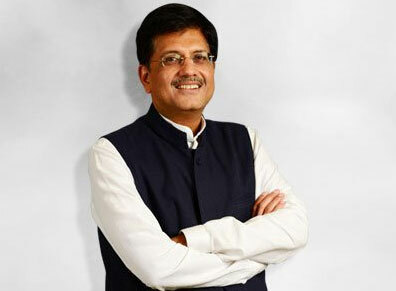 Piyush Goyal (54) is the Minister of Railways & Minister of Coal in the Government of India. He is a Member of the Upper House of the Parliament of India (Rajya Sabha), and was earlier the Minister of State (Independent Charge) for Power, Coal, New & Renewable Energy (2014-2017) and Mines (2016-17). Mr Goyal’s tenure saw transformational changes in India’s power sector including the fast tracking of electrification of the nearly 18,000 unelectrified villages in some of the remotest and inaccessible parts of the country, the roll out of the most comprehensive power sector reform ever (UDAY), the success of the world’s largest LED bulb distribution programme (UJALA) for energy efficiency, and massive proliferation of renewable energy through the world’s largest renewable energy expansion programme. Other achievements include the elimination of coal shortages to improve the energy security of India and successful conduct of transparent e-auctions of coal blocks. During his 34 year long political career, Mr Goyal has held several important positions at different levels in the world’s largest political party, the Bharatiya Janata Party (BJP) and is in its National Executive. He has been the National Treasurer of the Party. He also headed the BJP’s Information Communication Campaign Committee and oversaw the publicity and advertising campaign of the party including the social media outreach for the Indian General Elections 2014. He has had the privilege of being mentored by stalwarts such as Shri Atal Bihari Vajpayee, former Prime Minister of India. He was also nominated by the Government of India to the prestigious Task Force for Interlinking of Rivers in 2002. Mr Goyal has had a brilliant academic record – all-India second rank holder Chartered Accountant and second rank holder in Law in Mumbai University. He was a well-known investment banker and has advised top corporates on management strategy and growth. He also served on the Board of India’s largest commercial bank, the State Bank of India and Bank of Baroda. His father, Late Vedprakash Goyal was Union Minister of Shipping, and the National Treasurer of the BJP for over two decades. His mother Chandrakanta Goyal was elected thrice to the Maharashtra Legislative Assembly from Mumbai. He is married to Seema, an active social worker and has two children – Dhruv, who is working in New York, and Radhika, who is studying at Harvard University, USA.